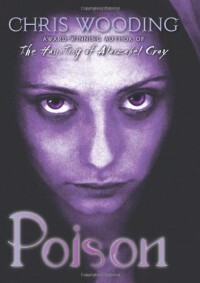 Poison is an unconventional selfish and morbid girl but thats just the way she was created and made out to be. She has tendencies to go through sporadic fits of rage, selfishness, and even Depression but they can all be excused in name of the grand picture. Chris Wooding's is always exceptionally thorough without being superfluous. His writing is the kind that makes me want to attain his level of skill. There's this fine balance of descriptive writing that borders between flowery excessiveness and succinct but exactness. Wooding handles the characters well and the Lady of Cobwebs's grotesque form and movements still give me chills afterwards. I hope I never have to meet a spiderlike entity after reading about Asinastra. The best parts are the books are not just the horrific actions but the amazing plot twists and revelation executions. It's so amazing that 'time', an undefined concept in the Realms, can be handled so well when involving the spacing of the plot. The journey was a by boring relieved by some black humor but the story picked up the slack in the latter half. The shocks and surprises alone should satisfy many thrilled readers and even forgive the strange ending. I however, liked the ending and thought it the perfect way to end this weird phaerie tale.